Vientiane (VNA) – Foreign Minister Pham Binh Minh met his counterparts of Norway, New Zealand and Canada on July 26 – the final day of the 49th ASEAN Ministerial Meeting (AMM-49) and related meetings in Vientiane, Laos. 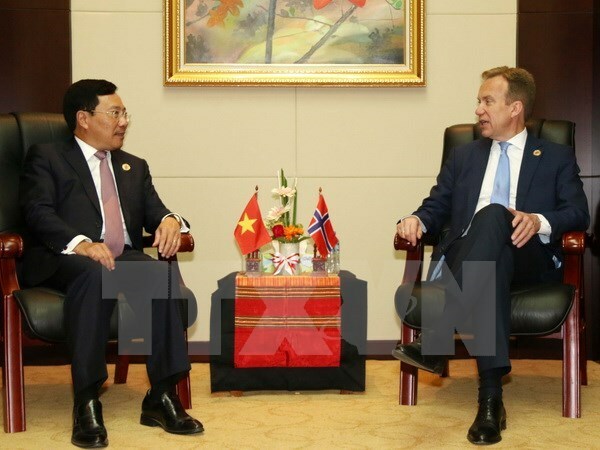 FM Minh and Norwegian FM Borge Brende agreed on steps to improve the efficiency of bilateral cooperation. The Vietnamese leader was committed to close collaboration to foster bilateral ties, saying that Vietnam will provide all possible support for Norwegian firms in Vietnam in the fields of climate change, renewable energy, shipbuilding technology, marine transport, oil and gas, and aquaculture. The two ministers agreed to work closely together at regional and global forums, contributing to promoting peace, cooperation and development in the two regions and the world. Minh and New Zealand FM Murray McCully expressed their pleasure at the practical development of bilateral ties and the positive growth of two-way trade and tourism with the opening of a direct flight service. The New Zealand side positively took note of Vietnam’s proposal to open the market for its farm produce and vowed to partner with Vietnam to successfully hold the Asia-Pacific Economic Cooperation (APEC) Meeting 2017 in the Southeast Asian country, as well as increase joint work within the ASEAN-New Zealand framework, and at regional and global forums. Meeting Canadian Foreign Minister Stephan Dion, Minh wished to reinforce cooperation with Canada in diverse areas, and that Canada would raise its positive voice to maintain peace and stability in the region and the world.